The Axis. It is not a place anyone knows about, and yet, somehow, everybody knows about it in a way they can't seem to recall or explain. Set in the center of all worlds and all universes, it is a place full of this and that and all the things in between. As you go to sleep one night, instead of being whisked away to a nice dream, you've been transported here, at The Axis, for a night of celebration and friendly communication and to strengthen the bonds between worlds. A night where people from all walks of life can come together, talk, eat and enjoy themselves, and perhaps even make a few friends along the way. General Information and OOC thread for this event can be found here! --Make sure to read all of the previous posts before you make your next one! This ensures that you don't miss out on something vital, and can help to keep your character from missing out on some fun interactions or appearing rude by accidentally ignoring others! --The event host (Sailor Saturn) will often post a goal for everyone to reach for throughout a certain period of time. This is normally depicted in a quote box to make it stand out a little more! These are generally guidelines to try and help move the plot along, but they are not mandatory to complete. --Keeping a regular posting regimen helps keep the flow of the event going strong! And your character plays a vital part! Of course, things can come up and hinder you from posting, and there's nothing wrong with that. Simply let the event host (Sailor Saturn) know, or post in the OOC thread for the event! If you have any concerns or problems, please contact the event host (Sailor Saturn)! Goal: It is up to Benson to start the game off for us! After Benson has given us his two facts and one lie, the rest of the party guests can talk about which one they believe to be the lie! Feel free to speculate and ponder aloud with your fellow party guests, as this is meant to be a cooperate effort! 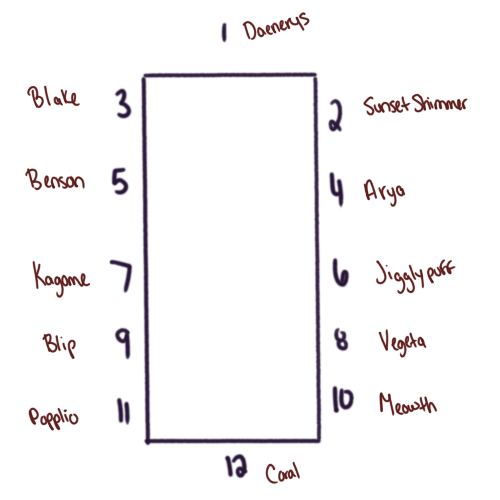 As a reference, here is the seating chart of all the guests. If you haven't given a specific chair thus far, I put your character in one of the available ones! All the things were in place - and it had certainly taken a lot of time to prepare. Tonight was full of a strange collection. The decorations were a mish-mash of so many different places, it had been difficult to keep up with them all. Each Dinner was to be a nice and even mix of all the cultures of the Guests, and as such, it was a painstakingly tedious endeavour. And Coral loved it all. She hoped she had gotten the strangely two-dimensional decorations to look right. She always had such trouble with them. The food table was her favorite. The plates and cutlery were all of Axis making - sparkling and bubbly and looked as though, in certain light, that they weren't there at all. But the food was another mixture of worlds. Little cakes with puffy frosting, berries of all shapes and colors, thick hams roasted with bright fruits, pies and breads, all kinds of drinks. She had been able to get a hold of some Earthen Japanese delicacies, and even a can of oil! Coral grinned to herself, quite pleased at her ingenuity. Most Dinners tried to keep the Guests somewhat close in nature - bringing over only those whose worlds were fairly similar. But, to the annoyance of most other Hosts, she liked to mix it up. Where was the fun in having everything the same? She looked down at the files in her hands and her grin grew. Yes, she was especially proud of this mixture of beings, and couldn't wait to properly meet them. Goal: Introduce your character and show their reactions to waking up in a strange place - a place that, somehow, also feels somewhat familiar. Each character should recognize certain decorations or foods on the table, next to tons of other things that are definitely not known to them. Feel free to begin talking to the other arrived guests, interact with the surroundings, or anything else they would feel like doing! Please note, any destructive powers your character may have do not function properly within the Axis! If you aren't sure if your character can use a certain power, ask in the OOC or PM me <3! Try to reach this goal by the end of the 22nd! The first thing that drew Benson's attention was the room. The banquet table was incredibly long, and adorned with fine china and cutlery. The second thing that was brought to his attention was that he had no idea how he got here, or when. No matter how much he thought about it, he couldn't recall driving to any building, let alone getting an invite to such a lavish feast. And the third was that there were many other people besides him present, or at least, some of them were people. A robot and a few animals-if Benson could even call them that, they didn't look like any animals he'd ever seen-were sitting among the table as well. He rubbed his eyes, thinking that he must be mistaken and was seeing things, but when he opened them again, the setting remained the same. Benson sighed heavily and began to rub his temples, suppressing a headache. Blake opened her eyes to find herself in a finely decorated room featuring a table bearing multitudes of colorful and unique food--and it was also not the room where she had gone to sleep not that long ago. Immediately on high alert, she immediately reached for her weapon, Gambol Shroud, but it was nowhere to be found. Anxious without her trustworthy chain scythe, she quickly scanned the room with her cat-like amber eyes for potential threats, but none were immediately discernible, and she was able to relax slightly. The room held a variety of people (and animals!) of all different colors, shapes, and sizes, piquing Blake's curiosity. But what was even more interesting to her was her familiarity with this place, despite the fact that she could not remember coming here before. Blake reached up for the familiar black bow on her head--should she take it off, exposing the cat ears that made her an outsider to many in her world of Remnant, or leave it on? Best to leave it on, she decided. Just to be safe. The last thing Sunset Shimmer remembered was writing in her journal to pony princess friend, Twilight Sparkle, before dozing off for the night. When she opened her eyes, she found herself not in her bed but in a fancily decorated banquet hall. Everything about the hall seemed alien and not of Earth yet it all seemed familiar at the same time. In coming here, she noticed that she had "ponied up" as her friend, Rainbow Dash liked to call it. Pony ears adorned her head and red and yellow streaked hair had grown down to her feed. If there was one thing she liked about her Equestrian powers was suddenly getting amazing hair. Sunset furrowed her brows wondering what sort of magic could be at work to not only bring her to this seemingly other worldly place but cause her to transform as well. Discord maybe? But Twilight had said he had reformed, though often had a fun of playing pranks on the ponies. Could Discord even get to their world? As she thought, sweet and savory smells filled her nostrils. She noticed that there was a beautiful display of food, many things she recognized. Her mouth watered slightly and noticed her stomach grumbled. Had it been that long since dinner? Was that a candy buffet? Distracting her thoughts even further, Sunset turned as she heard noises of other people and...animals?...in the room. Everyone looked so different and she was positive many of them couldn't have been of Earth...the Gumball machine looking being certainly had to be an alien. This certainly couldn't be real. She said aloud to no one in particular but hoped she might find an answer. Fancy table settings with tableware that shone brilliantly in the softly dimmed lights... This... Wasn't right... Meowth woke, seated in a chair lining a long table with a clean white tablecloth on it, which confused him. Last he remembered, he was being 'blasted off' with fellow teammates Jessie and James after a failed scheme to capture that twerp Ash Ketchum's Pikachu. Had he been split up? It wasn't an unusual occurrence for a team member to land elsewhere from the rest of the group. But never had anyone woken up in a place such as this. Around him sat a multitude of beings, some he recognized, but most... Not so much. Nearby was a Jigglypuff he thought he might know and a Popplio. It was nice to see other Pokemon up in this joint. There were also many humans, none of which were Jessie or James, Meowth's compainions... But thankfully, none of the twerps were here. There was a being who resembled some sort of human machine that he couldn't put a name to, perhaps a new Pokemon? Also at the table was a robot thing. Doubtful that was a Pokemon. He couldn't even tell if it had a face! None of this really interested him as much as what was on the table. Lining the table was more food Meowth had seen in months! Most of which looked very appetizing. Pokepuffs and berries galore along with other treats he'd had before, if he was lucky. It was rare that Team Rocket ever got a good meal. The smells of it all made his mouth water, he couldn't wait to dig in! The starving scratch cat Pokemon started to reach for food, his eyes wide and stomach growling. Sure, Benson had been teleported against his will into a wide array of random and strange shenanigans-mostly due to the blunders of Mordecai and Rigby-but none as strange as this. At the very least, one of the employees from the park would have been dragged into this strange event with him. When was the last time he found himself in one of these strange events all by himself? This sudden thought shook him a little, and suddenly the formal layout of the place seemed a tad suspicious, if him suddenly being brought here wasn't suspicious enough. Benson nearly jumped out of his skin when the cat creature spoke out; clearly delighted at the wide array of food before them. He jumped upright from the table, pointing in it's direction. "Okay, I'm not the only one who heard that right? The cat-that cat thing-it just spoke." Popplio looked around some more then a weird thing spoke and it was speaking to..a meowth?? He the stood up saying, "Hey..yeah of course it did..you..what kind of Pokemon are you? anyway..thats Meowth..and your not the only weird thing her that can speak..." he then looked at Meowth and said, "Hey stop! wait for the others.." Popplio was kind..to as many as he could. Where was she? Why weren't her friends here with her? The room looked...oddly familiar, yet something about it seemed so foreign. Could this be the inside of Valhalla Palace, the place where those defeated in battle came to revel after death? Then where was Odin, and why wasn't he explaining anything to her? Was she in fact dead for real this time? Arya sighed and shook her head. What a ridiculous thought! Odin wouldn't whisk her away to her death while she slept, or so she would hope. Perhaps this conundrum was all her fault. Being raised by humans instead of her own kin, the young esper wasn't always the best at controlling her innate abilities or remembering exactly how to access them in times of dire need—though at this point, it seemed unlikely to Arya that she had mumbled some sort of incantation in her sleep that would have accidentally teleported her here. In fact, she didn't even know how to teleport!...Or did she? Arya sighed again. At least she would like to think that she had more control than that over her powers. Benson stared blankly. It seems one of the other strange animals began talking as well. Not only that, but it thought he was one of them? It was weird for him to be talking? His head buzzing with confusion, he sat back down, put his fingers in between his eyes, and took a deep breath. "Look, little...otter-thing. Where I come from, animals don't talk. Like, at all. And I have no idea what a-a poke-" Benson struggled to pronounce the phrase, groaned, and continued. "A whatever-you-said, but I can tell you I'm not one of those." Benson silently prayed to himself that he had that bottle of aspirin in his pocket that he always carried around since his job at the park was so headache inducing. Upon checking it, not only was it missing, but so was he wallet, car keys, and cellphone. He threw his arms up in defeat, emitting a small cry of frustration before folding them across his chest. "Well, this just seems to be getting better and better." He grumbled. The round pink orb slowly rolled over, the tiny mouth yawning sleepily. As it righted itself onto the small narrow feet, it yawned again and stretched tiny nub-like arms. When it blinked, the massive teal eyes were suddenly revealed, reflective and bright. Jigglypuff's ears twitched, listening to the noises in the strange place. This was not where it had fallen asleep. It had been in a forest, following that group of particular Pokémon trainers, looking for somewhere to perform. Of course, that's what Jigglypuff was always looking for. Someday it would find a place to perform with an audience that appreciated real music! Just thinking about this made the pink sphere puff up its cheeks and direct a determined gaze towards the sky. Someday! This was a new and unusual place. Could this finally be the venue that Jigglypuff sought? It turned around to observe the group, not recognizing anyone at first, although there were a few other Pokémon present... oh wait. There was that Meowth—the one from Team Rocket. "Puff, jigglypuff jig-puff?" it said, tilting its head at the whiskered creature. When Sunset got no reply, she sighed and resigned that this was just indeed a dream and with the smorgasbord of food in front of her and the obvious decorations of what appeared to be a fancy ball, she decided to just roll with it. The animal creatures began to talk, which didn't surprise her at all. In fact, it was more their appearances that looked alien to her, even after all of the magical creatures she had seen in Equestria, the animals between the human and Equestrian world usually looked about the same. Dogs were dogs and cats were cats. Picking up a cup of a sweet looking pink punch, she sipped the bubbly drink and quietly observed the hall. She discovered the cat like creature was called Meowth from the otter/seal looking thing. The gumball machine acted surprised when it talked, resulting in an eyeroll from Sunset. "He's a talking gumball machine and the strange thing is a cat talking?" She mumbled sarcastically into her cup. A high pitched voice spoke up, Sunset turned and discovered a round pink puffy ball things...with eyes. She would have thought it was the cutest creature in the world had it not been so odd and pink. She smirked to herself, thinking how Pinkie Pie would have immediately wanted it as a pet. It spoke in a weird language, but somehow she found herself understanding what the creature said. Sunset walked over towards where the conversation had started, feigning confidence in her stride, despite how nervous she was being in such a situation and around strangers to boot. "At least none of them will know about your past." That thought consoled her and gave her a small confidence boost. "I'm not sure entirely. 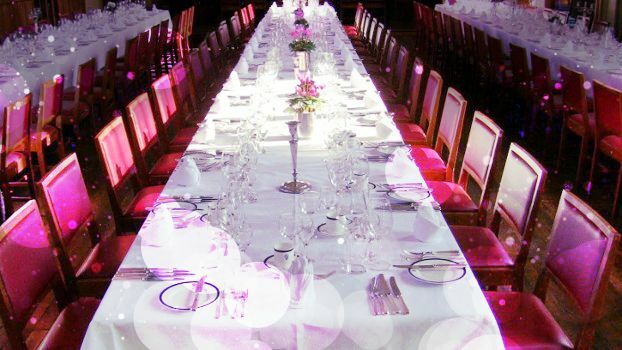 This place seems like a magical banquet," as she spoke she gazed around the room in awe. It truly was grand. "Hi, I'm Sunset Shimmer. What--I mean--Who are you?" She directed her question at everyone within earshot of her. Might as well try to make some friends while figuring out what the heck was going on. "Yeah I just spoke! You got a problem wit that?" Meowth asked, pulling away from the food, crossing his arms. "You're a talking machine! You're the one who's strange, not me. This ability was well worked for!" He huffed looking at Popplio. "Why should I? Ain't nothing say we can't eat! What's the point of all this food if we can't eat it?!" The scratch cat Pokemon looked to the Jigglypuff, "I'd tell ya if I knew pal. All I know is I'm starving, there's food on the table and a bunch of weird strangers around me." He looked to the girl who just walked over, "Like that one. I don't know of any humans with pony ears and hair that long. Are you some sort of new Pokemon?" Kagome just fell asleep and then she woke up in a big hall with some weird people .She tought this was a dream and then she took a seat next to a talking cat .Seeing that all the people do nothing than introducing themselves she did so too . "Hey ,you are so cute !What is your name ? My name is Kagome Higurashi !" "Puff puff, Jigglypuff!" it replied to Sunset Shimmer, grinning widely. The round creature blinked adorably and looked from face to face as those around it continued conversations and asked more questions. It appeared that even Meowth—usually the one to blame for this kind of thing—knew nothing about how they had gotten here. Well, that was alright with Jigglypuff~ ♥ The dining room before them contained a variety of delicious treats; the smell alone was enough to awaken this rosy orb's dormant hunger. It shuffled closer to the banquet table, humming contentedly as it did so. The round eyes sparkled when it spotted a particularly delectable morsel: Old Gâteau! It had been a long time since Jigglypuff had visited the Old Château to try their specialty! If only it could reach! As Arya tried to make sense of herself waking up in the vaguely familiar banquet hall, her attention was brought back to the monsters which now appeared to be congregating around the table for some reason. Perhaps they were planning a group attack? Arya wondered to herself as she cast her suspicious glance upon the trio. If they dared attack her or anybody else in this room, she would step in and quickly dispel the situation. They did not look particularly formidable. The blue creature that resembled a familiar with its sapphire fur, white mane, large front paws, and stubby legs, knew a fire or ice spell at best; the robotic creature with the globular head, a rogue mecha? appeared completely unarmed; and that cat?...Well, it looked like a cat. These creatures were clearly nothing to be afraid of. Fighting them would be a breeze, and as a bonus, she could even harvest their meat after she was finished! The pink one—a slime perhaps? that just rolled over to the group looked especially delicious. The voices were what activated him. It had been so long since he had heard voices - and even longer since he had been activated. His joints were rusty, and his processor took longer than normal to boot up. As Blip turned on his sight, the bright green lights flickered for a moment before regaining their normal brilliance. He turned to look around at his comrades - trying not to feel too embarrassed about the subtle creak of his joints as he did so. But these were not the faces he was expecting to see. After working so hard on the forest, after years and years and finally finishing his work, he had expected the next faces he would see would be that of his comrades. His friends. A strange occurrence. He hoped that they would not be tardy for long. Blip remained as quiet as he could - he could do nothing about the slightly louder than normal hum of his inner workings, nor the grating sound of metal against metal. The comment about a cat talking caught his attention, and after a moment of processing such a comment, Blip didn't find it strange at all. One of his friends was a frog after all. It sounded as though there were a few introductions being given, and it would have been rude of him not to introduce himself or offer his services. "My serial number is R-66Y," he gave automatically. It was ingrained within him, but he was reminded of his friends giving him another name. His own name. "However, Blip is my preferred denomination. Please to make your acquaintance." After that, he gave several respectful bows towards each of the beings within the room. He hoped that the creaks from the bending weren't too noticeable. Benson was a bit irked as to how the cat spat back at him, and was well and ready to retort back, when the pink animal started talking. Only it actually wasn't talking. It seemed to know only one word, but somehow, Benson could hear both that and actual words coming from its mouth whenever it spoke. It was almost like telepathy-if telepathy could work outside of someone's mind and out in the open. It was a little more then confusing. "What the..?" He found himself mumbling out loud, as he watched the pink animal talk with a human looking individual-if humans had flaming red and yellow hair with yellow skin. She, along with a normal looking black haired girl started introducing themselves, and the robot introduced itself as well. Overwhelmed and still trying to make sense of this current situation, if any sense could be made of it, he averted his gaze for just a second-and happened to catch a rather intimidating stare from a blond haired girl from a different part of the table. During his training with Kakarot, Vegeta suddenly got sick. Normally Saiyans don't really get sick, since their bodies aren't as vulnerable to diseases as the ones of other races, but if they do - oh boy do they get sick. Now he woke up in a strange place, called 'The Axis'. The last thing the Saiyan Prince remembered is going to bed, before getting some weird medicine from Bulma. Where am I?, he silently asked himself. Am I...dead? NO, this couldn't be. Such a puny cold could never kill the legendary Prince of all Saiyans - Or could it? Vegeta looked around. The place he was at certainly didn't look like hell... at least not like the one he has been to. I'm sure this cold didn't kill me, so I'm most likely alive. But where exactly am I? Maybe he was dreaming? But everything didn't feel like a dream to Vegeta. It was too real and he remembered everything that happened before he went to sleep. A weird pink blob, which looked like Majin Buu fused with... - Vegeta couldn't even come up with a thing Buu could fuse with to end up like this. A talking cat - maybe the God of Destruction from the place he's at right now? Although it looked nothing like Beerus or Champa. A robot that looked like the one from Universe 6 Vegeta fought against. Some women - One of them with red and yellow hair and another one with cat ears. Vegeta has heard of some weird fashion trends before, but this one has to be the weirdest. Then there was a guy with a round face and some sort of animal. What exactly has he gotten into? Only one thing was sure: Vegeta didn't like it. The "people" around him seemed to introduce themselves. Not like Vegeta cared about it, but maybe someone or something here knew more than him. "I am Vegeta, Prince of all Saiyans. CAN SOMEONE TELL ME WHERE THE HECK I AM? ", Vegeta shouted so everybody could hear. “Oh, um...” Arya blinked and adverted her gaze when Benson took notice to her staring at the group in silence. The esper took the creature's inquiry as an invitation over to the table, but before making her way toward the group, Arya made sure to lower her staff, as it would be quite rude to approach them with a raised weapon. “Perhaps,” she replied with a slight shrug, as she stopped in front of Benson and made eye contact with him. Out of the monsters, this one seemed the most befuddled by everything being said and done by the room's other inhabitants, so Arya was not sure that he would be too helpful. However any information at this point would be valuable. Besides, if he didn't know then maybe somebody else here would, like that robot calling himself Blip! Robots were usually well-informed individuals. “The name's Arya,” the young esper stated, extending her hand outward with a slight smile upon her face to show him that she meant no harm. “Do you happen to maybe know if this dining hall is a part of the Valhalla Palace? Or perhaps, the name of the god ruling the world we are currently in?” From personal experience, Arya was well aware that not everybody knew multiple worlds existed, or that divine beings—the gods, muses, and even Isis herself—watched over them, but it was worth a shot. As she waited for Benson to reply, some muscular guy with spiky black hair began to demand, in his booming voice, answers from everybody. Geeze...Could he yell any louder? Arya offered the shouting man an over-exaggerated frown that suggested the following subliminal message: are you frigging serious? A Prince? Tch. She rolled her eyes. He sure didn't sound like a nice one. He sounded so full of himself, like...like that lousy goddess Venus! The esper still couldn't believe that the Lady herself had banished a young man from the city for crippling his leg in an accident, deeming him far too ugly for the beauty of her metropolis. What madness possessed a ruler to punish her subjects so severely over something as trivial as an injury? Arya looked back at Benson and then again to Vegeta with the same frown upon her face, a slight look of uncertainty manifesting in her gaze. She sure hoped that the armor-clad man wasn't that type of ruler. The loud man with the spiky black hair seemed to have the height and muscles necessary for the task at hand. "Puff! Jiggly puff puff, jigglypuff!" the pink creature chirped, eyes bright with the prospect of acquiring the delicacy that it sought. Despite the disadvantageous height, it could still see that the slices of Old Gâteau looked creamy and rich with chocolate and ground nuts. Jigglypuff couldn't quite catch the gentle aroma from this angle, but it still remembered the excellent scent of the dessert. That kind of deliciousness was not forgotten so quickly! It gestured towards the food table with one nubby arm as it continued to make its plea. Although it could jump fairly easily, using its balloon-like body to bounce, so far there seemed to be little hope of reaching the dessert in question on its own. But this man was so incredibly tall and strong that there was no way he could have any issues reaching it. Vegeta sure got the rooms attention with his shouting, but sadly no answers about his whereabouts. But there was a girl that caught his attention. She stood with the round faced guy and some of the more weird "people" not too far away and threw a frown at him. The look in her eyes seemed strong and Vegeta liked it. "WHAT ARE YOU LOOKING AT? ", he shouted in the woman's direction, "NEVER SEEN A REAL PRINCE BEFORE?" But he was distracted by some weird noises. "Puff! Jiggly puff puff, jigglypuff!" It was the weird Buu look-alike standing right next to him. Even compared to Vegeta's size it was tiny. He didn't know why, but he could understand the weird noises the creature was making. "So, you want cake? How about getting it yourself? Can't you see I'm busy?" Why am I even answering to such disrespectful demands? Vegeta sighed, picked up the pink blob and held it in front of his face. In it's hand he noticed some kind of marker. What exactly is this creature? "Well okay, give me one good reason to give you the cake." The Pokémon made a briefly displeased face when the very loud prince lifted it into the air, but it reserved any reaction for later. After all, Jigglypuff still had a "secret weapon" aka "that black permanent marker-slash-microphone". This didn't seem like the right time to use that precious item. Perhaps, if this was truly the perfect audience for Jigglypuff to sing to, it wouldn't even have to resort to marking up! Ah, if only that could be the case! It jolted from its delightful dreams of the future by the armored man's demands. From the current close-up vantage, it noticed how thick and dark the man's eyebrows were. They almost looked like a work of art from Jigglypuff's own marker! It took a moment to pause, considering the question that had been asked, but quickly decided on an appropriate answer. "Jiggly-jigpuff!" Benson stayed a bit alert as the woman approached-doubly so once he saw that her ears were pointed. It seems that she was a supernatural creature as well. "I um-I wish I knew." He answered honestly. "I just appeared here too, and would sure as heck want some-"
Suddenly, a loud booming voice demanded the attention of all in the banquet room. Benson jumped, and turned around to see some tall, muscly guy with spiked hair barking his demands. "-Answers." He finished with a sigh. "Great. And now we've got one of those emo jocks here. What next?" He had plenty of those kind that came to the park in groups, mostly from local colleges and high schools. They always thought they were above rules and above common courtesy. Seeing this guy argue loudly as to why he should waste his time helping that small pink animal to a piece of cake was certainly not the first impression he would have wanted, but seeing his hairstyle and how he kept calling himself "prince"; In the end, it wasn't surprising to him in the least. "Is that an insult or a compliment?" Meowth asked, looking to the girl who had just sat next to him, studying her. She seemed nice enough, he'd met nice girls like her before. Maybe she even had a cute cat Pokemon like himself... With that in mind he lightened up, "The name's Meowth!" The cat like pokemon looked to the robot, "Well, looks like the robot thing can speak. That's... Strange... Never seen one that could speak, unless... Are you possessed by a Rotom?" He asked. Taking a moment, Meowth made sure no one else was eating yet as if they could eat, why shouldn't he? "Woah there! Calm down a bit there! No need to be yelling when this place has all this... delicious... Food..." Meowth purred, looking to the food with great desire. But keeping the Popplio's words in mind, he decided to wait. "Who do you tink you are anyway? I'd think a Prince would be more regal maybe a bit kind. And put that Jigglypuff down, would ya? Doesn't matter who ya are, ya don't do that to that specific Jigglypuff. Unless you wanted a mustache." He laughed. Sorry if this reply is a bit awkward! Blake narrowed her eyes at the large man who had suddenly caused a ruckus, calling himself a "prince" and then quite rudely picking up the small pink creature who had simply wanted a piece of cake! Enraged at the treatment of the small pink creature, who had looked briefly displeased when that man had picked him up, Blake quickly strode across the room and stopped directly in front of the imposing figure. "Hey! Is that any way for a prince to treat others?" Blake then plucked the round and fluffy creature from the so-called prince's grasp and set him back down on the floor, then promptly picked the piece of cake off the table, squatted down to the small creature's eye level, and held out the cake in front of her. "Here. Take it," she said with a small smile. Blake then raised her eyes up until see was looking at this "Prince of All Saiyans" squarely in the eye, and gave him a look of utmost derision. She couldn't stand the mistreatment of any creature, and this man had no right to this small pink creature so rudely. Prince? No, but I've come in contact with several gods during my travels, she thought in annoyance, keeping her comeback to herself. Ugh, this guy seemed more hostile than the monsters at the table. Arya was starting to feel bad for previously assuming the worst of the little critters. "Drogon...it seems we are not in Meeren anymore." Daenerys whispered to her dragon, who only hissed indifferently as she eyed the elaborate room she had found herself in and the guest that were already beginning to mingle with one another. Was she having another vision similar to those in the House of Undying? The ancient warlocks had all died after her encounter with them so it couldn't be possible. If she did happen to be in some type of 'vision' then she need to quickly find her way out of this place. Sighing to herself in frustration, Dany made her way to the very head of the banquet table. Being a Queen, sitting at the head of the table was the most fitting place to sit for one of her stature. She had already been late here and a Queen should never be late so she had to make sure she was taken seriously by these strangers; whether they be hallucinations to deceive her or not. Pokemon? What the heck was a-- She was about to reply back to Meowth but a loud booming voice announced his entrance. She lowered her eyelids in annoyance and placed a hand on one hip, giving the man,Prince Vegeta, an unimpressed stare. Others began talking and Sunset was doing her best to keep up. Surely Princess Celestia's teachings could have prepared her for this. The man rudely scooped up Jigglypuff who was after a sweet confection on the table. All the cute round thing wanted was the treat, did he have to tease her like that? She was just about to walk over to give him a piece of her mind when another girl spoke up...and she completely agreed with her! She liked her style. Sunset walked up beside her to back her up. "She's right! You shouldn't go picking up people or er...creatures against their will!" She almost barked the response at the man as loud as he announced his presence, but seeing his muscular build, she held back a little and corrected it with a somewhat friendly but stern tone. "None of us know why we are here but it doesn't mean you can go about doing what you want." Maybe food will get him to quiet down. The thought came as she remembered Flutteryshy's kindness to others, no matter how big and scary they could be. Sunset picked up a few more pieces of the sweets and offered them to the new girl and this "Prince". "Here. Why don't you eat while we figure this out?" Maybe this was some sort of strange lesson of friendship she had to conquer? Even if it was a dream she was going to have a lot to write about to Twilight.